As a pacifist, I don’t know what to do about Veterans Day. On this year’s November 11, I drove down the main street of a town that is home to a naval air station. Five days earlier I’d travelled that same route the opposite direction on my way to a writing workshop. That morning, winds had gusted at 35-45 miles per hour and whipped the American flags that lined the street in a wild dance. But on Veterans Day, the sun shone, and the red and white stripes fluttered in a light breeze as I drove toward home. I tuned the car radio to NPR and listened to how some people across the country were honoring veterans. The station played an excerpt of Vice-President Joe Biden’s speech at Arlington Cemetery. 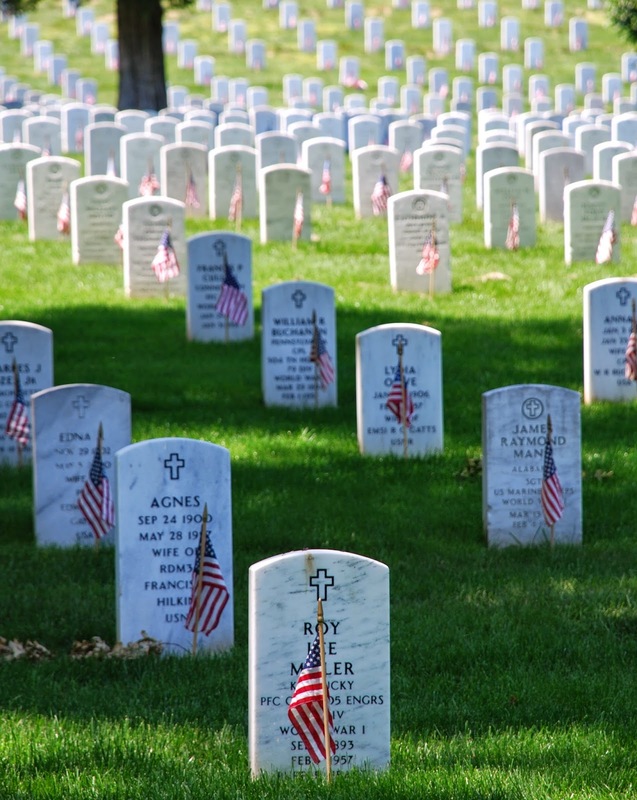 I pictured the rows of white tombstones lined up over the burial ground’s 624 acres; over 400,000 veterans have been buried there since the Civil War. 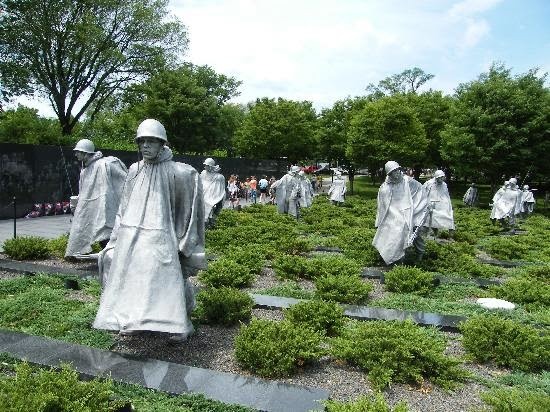 The words and mental images got me thinking about those veterans and about the new poetry book in my backpack, Nothing Saved Us – Poems of the Korean War by Tamra J. Higgins. Intrigued by the title and the subject matter, I’d ordered the book a few weeks earlier when a friend posted a notice online about it. Over the course of two years, Tamra interviewed her father about his experiences as a Marine on the front lines in the Korean War. She turned the results of those conversations into poems to show how soldiers cope with war’s absurdity. She used short and abrupt lines to reflect the rhythm and syntax of her father’s voice. Although I’d had time to read at the workshop, I hadn’t even opened the book. The author’s exploration of this “forgotten war” had compelled me to buy a copy, but it was also what made me resist reading it. My stepfather served in the Marine Corps in Korea. That was nearly ten years before he came into my life when I was six. He never talked to me about his time in the Marines or about the war, but my mom was proud of his service and told me he’d received a purple heart medal. All that I remember is the tattoo on his left forearm—a ferocious-looking bulldog wearing a helmet with the letters USMC inked underneath. When my stepfather died twenty years later at age 54, that medal he’d been awarded entitled him to burial at Arlington Cemetery, a thousand miles from our home in southern Illinois. Instead, my mom arranged for Marines to preside at our small town cemetery; they presented her with an American flag crisply folded into a tight square. Earlier this year I visited the Korean War Memorial in Washington, DC. Tears choked me as I walked among the 19 stainless steel, larger-than-life-size statues representing a squad on patrol. I looked for one that resembled my stepfather and tried to imagine him over sixty years ago, among those soldiers trudging through Korean villages. I walked the length of the 164-foot-long black granite memorial wall. Photographic images were sandblasted into it depicting soldiers, equipment and people involved in the war. I was grateful that no matter how long I searched, I wouldn’t find my stepfather’s likeness, because he had survived. In this past week I’ve read all of the poems in Nothing Saved Us, admired and appreciated those stories by another daughter of a Marine. A daughter who could listen, did listen, to her father’s stories. Tamra Higgins’s dad sounds like someone my stepfather would have liked. He received a purple heart, too, for injuries he sustained that cost him his right leg. But the soldier’s life is only part of the story of war Tamra wanted to portray through her poems. As she researched the Korean War, she read several memoirs of Korean women who had been trapped in the throes of that battle. In the second section of the book, Tamra explores the impact of war on civilians through the voice of a Korean woman. In these poems, Tamra used long lines, based loosely on sijo, a traditional style of Korean poetry developed more than 750 years ago. That story is heartbreaking, too. So, where does this exploration of Veterans Day and the Korean War leave me? Tamra’s poems and the flag-lined street don’t evoke for me pride or even gratitude for the veterans’ service. I grieve for my stepfather and Tamra’s father and all the other men and women—military and civilian—who experience the violence of war. I grieve for the children who lose parents, the parents who lose children, the spouses who are widowed. I grieve for the land, the homes, the businesses, the places of worship, and the national treasures that are destroyed. And as I drive along flag-lined streets, I pray that someday we’ll put an end to war. Thank you for speaking about my book in your blog. I never thought I would write a book like this, but with the encouragement of a mentor decided to. The most difficult thing about the project was the publication of it, firstly because no one wanted to publish such a “niche” book and secondly because I began to doubt myself that people would want to read such a collection. Since the book has been published, I've been surprised how many conversations I've had with people – many whom I've known for years – about their fathers or grandfathers who served in Korea and who, like me, didn't know much about it. Yesterday, on a trip from Vermont to Iowa to visit my parents, I stopped by the National Korean War Museum in Springfield, Illinois. The museum has excellent and moving displays honoring those who served in the Korean War. I highly recommend visiting it if you ever get the chance. I look forward to reading your other blog posts. Thank you, Tamra. I’m not surprised by the struggles you encountered with publishing, and I’m grateful you persevered. 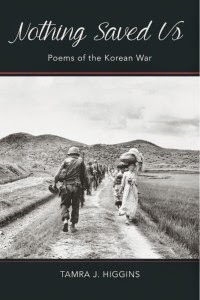 Your poems fill a gap in literature about the Korean War and a perspective on that war from both a U.S. soldier and a Korean civilian. As I wrote in my blog, I never had such conversations with my father; your writing about yours with YOUR dad eased some of my own longing. As a fellow writer, I also admire the beautiful craftsmanship of your poetry. mBest to you in your work. I am a bit late in bumbing into this touching piece about Veterans Day. So glad that I did. Its a blessing. Most people have now forgotten that this was originally Armistice Day, the celebraton of the end of bloodshed in WW I on the 11th day of the 11the month at 1100 hours. Thank you for writing, Michael and for telling me about your book. Remembering the WW I Christmas truce can give us hope that we’re capable of resolving conflict without violence. I appreciate the reminder of the centennial of that event and of the origins of Veterans Day/Armistice Day. Thank you for your work.